Choosing between local impact or broader scale is a vital differentiation in our professional paths. My buddy Daniel Victor was named the new social media editor of nonprofit public affairs news outfit Pro Publica, and so I reluctantly bade him farewell from his brief few months at Philly.com and with the local ONA chapter. Having developed a good friendship with Victor, I’ve followed his exciting and deserved fast-paced climb up the journalism ladder: from Harrisburg, Pa. newspaper the Patriot-News to D.C. news startup TBD to regional powerhouse Philly.com to investigative, foundation-supported journo-brand giant Pro Publica. Knowing my personality, I took some time to think about whether spending the past few years building a very local, very niche outlet like Technically Philly was the right fit for me. Frankly, I’m not altogether certain, but it has occurred to me that we can only choose one of two paths professionally: local impact or broader scale. There’s a pendulum somewhere, and it swings between those two extremes. We can touch both, but I think mostly — with the constraints of time and focus and work — our professional lives fall on one of those two tracks. It’s some variation of the 80/20 rule, where in any given industry or community, 70 percent of the people have a marginal impact, 25 percent have a very local impact and five percent have a very national impact. 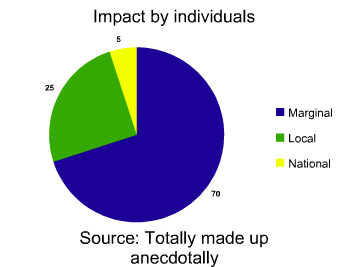 What is, at times, perplexing is that national impact doesn’t always mean more impact, or impact on more people. In the most high minded of ways, impact is meant to mean influence: influencing people’s decisions, policy, action, perspective and events. Most often, it never reaches that level, so we must understand our work will only ever be found by a very small group of people. When your work is national or even broader in scope, it will find more people but might resonate deeply with far fewer of them. When your work is local, it will find far fewer people but might resonate deeply with many of them. We need people pursuing national and local work. There is good in both and reason to do both. So it’s a question of choice. Many people will confuse scope with impact — more audience must mean more meaning — and so will chase the wrong direction for the wrong reasons. Others get it — Victor wants a bigger stage and new challenges and he has earned it — but it’s important to know what you want. Previous Previous post: Is your news organization a fire hose or a block party?